This invoice software allows you to run invoices based on T&M (Time and Materials) or fixed cost services. It’s an ideal invoice software solution for freelancers, or small businesses. Smart looking invoices, easy to generate, customize to meet local language or billing requirements, email, or export to PDF. Flexible tax options. This invoice software package (FREE version is available, with single user time tracking and invoicing functionality) allows you to create industry standard invoices with wide customization options, easy to generate, easy to handle. See the screenshots to learn more. Summary or Detailed invoices that you can save, edit, email, print out, or export to popular file formats, including PDF. Easy Time Tracking is invoice software to meet your every need. Invoices you generate are stored in the database along with your time logs and expenses and can be viewed or edited at any time. To create invoices this invoice software uses existing time entries and expenses or, alternatively, new records can be added as you’re working on an invoice. As you keep saving more invoices, you can view statistics including total due to be paid, total taxes collected, as well as payments made to you to date. Customer billing cannot be easier with Easy Time Tracking, user-friendly invoice software! Up to two taxes can be used, independently or tax on tax. Record payments as you receive them. respective invoices to make sure you are paid in full. Filtering by customer and invoice number is available for your convenience. Create invoices in your own language! Now with a wide range of customization options, invoices generated by this invoice software are designed to meet the strictest requirements. You can let the invoicing software create an invoice for you based on time logs in your projects, or you can create one line by line from scratch. The way its elements are arranged on the page is easily changeable, with the layout preview panel an additional comfort. All labels are editable, so you can make your invoice out in any language there is. Email invoices right from where you created them. No more hassle over getting and installing a PDF printer to print out to PDF and then Email your invoices! This time tracker and invoice software will do it all for you! Once an invoice is generated, it can be emailed straight away as a PDF, TIFF or Webpage Archive document. Simple, quick and reliable! 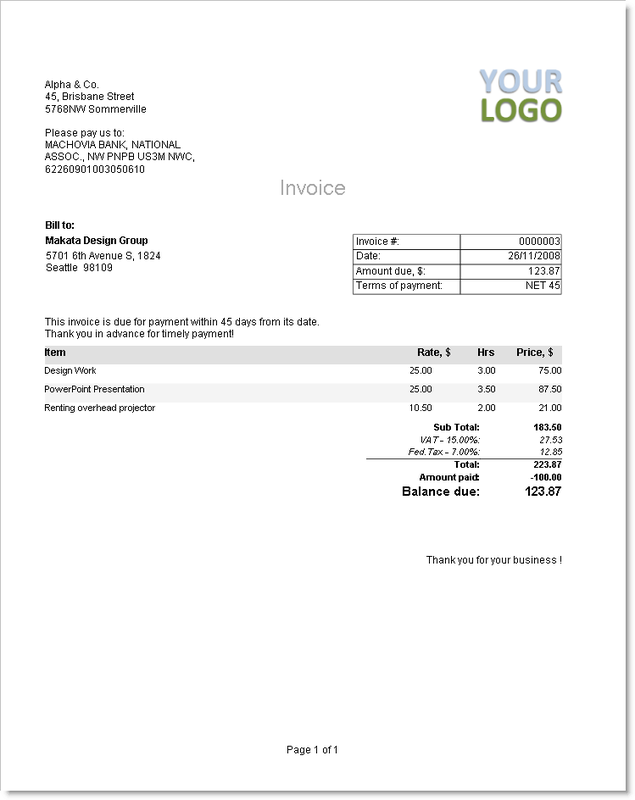 Generated invoices can be immediately exported to PDF as well as two other popular formats. Prefer to handle your invoices as PDF documents? The invoice software has got a built-in PDF converter that allow saving your invoices to a PDF document. Additional supported formats are TIFF, and Webpage Archive document.